AZMOL Famula x 15W-40 is a universal motor oil designed for high – load engines that meets the requirements of API CJ-4 and is designed with unique high-performance saps additives. 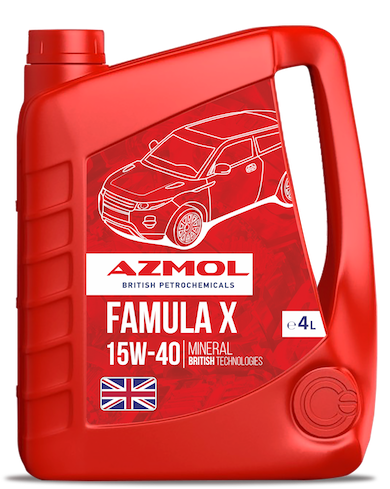 AZMOL Famula x 15W-40 oil is suitable for use in trucks with EURO 5 engines with exhaust systems and EURO 3 and EURO 4 engines, if required by the engine manufacturer. Recommended for trucks with exhaust gas recirculation (EGR) and SCR (selective catalytic recovery) with ULSD (ultra low sulfur fuel - 15 ppm maximum sulfur) and regular diesel (500 ppm sulfur) from Volvo, Mack, Renault, MAN, Iveco, Daimler, DAF, Caterpillar, Komatsu for DPF (diesel particulate filter) as DPD (diesel separator with particles) from ISUZU, MAZDA,NISSAN, commercial vehicles (off-road diesel engines).